Bana Singh is a retired soldier of the Indian Army who is one among the only 3 living recipients of the Param Vir Chakra. He is best known for his role in the Operation Rajiv during the Siachen Conflict for which he was awarded the Param Vir Chakra. In this article we are going to have a brief look on the life of this living legend and his contributions to the country. Bana Singh was born into a Sikh family in Kadyal in Jammu and Kashmir on 6 January 1949. His father was a farmer and his uncles were soldiers in the Indian Army. His son Rajinder Singh joined the Indian Army in 2008, at the age of 18. After his retirement, the Jammu & Kashmir Government offered him a pension of ₹ 166 per month. Bana Singh protested against the low amount and pointed out that Punjab and Himachal Pradesh provided a monthly pension above ₹ 10,000 to the Param Vir Chakra winners. In October 2006, the Punjab Government led by Captain Amarinder Singh offered him ₹ 25 lacs, a monthly pension of ₹ 15,000 and a 25-acre plot, if he moved to Punjab. However, he refused the offer and said that he is a resident of J&K and will only live in J&K. The J&K Government named a stadium in the RS Pura area of Jammu after him, and sanctioned an amount of Rs 50 lacs for its development in 2010. However, in 2013, 'The Tribune' reported that the funds had not been released and the Bana Singh Memorial Stadium was in a poor condition. He got enlisted in the Indian Army on 6 January 1969 into the 8th Battalion of the Jammu and Kashmir Light Infantry (JAK LI). He was trained at the High Altitude Warfare School in Gulmarg and also at another school at Sonamarg. During the Siachen conflict, he participated in the Operation Meghdoot and the Operation Rajiv. In the Operation Rajiv, as a Naib Subedar, he led his team to conquer the highest peak in the Siachen area. The peak was named as "Bana Post" in his honour. On 26 January 1988, Naib Subedar Bana Singh was awarded the Param Vir Chakra. At the time of the Kargil War, he was the only PVC awardee who was still serving in the Army. 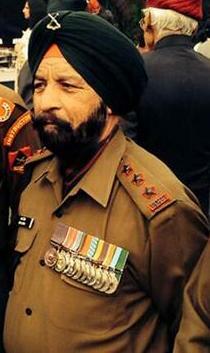 Naib Subedar Bana Singh was promoted to Subedar and eventually to Subedar Major. He was given the honorary rank of Captain. Hony Capt Bana Singh retired from service on 31 October 2000. Naib Subedar Chuni Lal, who was with Bana Singh during the Operation Rajiv went on to be awarded the Sena Medal for his contributions in the operation. He was just a Sipahi back then and had just 2-3 years of service experience. He later went on to win the Ashoka Chakra and Vir Chakra in his career and is currently serving in 8 JAK LI. In 1987, Pakistani forces infiltrated the strategically important area of the Siachen glacier. They had captured an important position, which they called "Quaid post" (from Quaid-e-Azam, the title of Muhammad Ali Jinnah). The post was located at a height of 6500 metres on the highest peak in the Siachen Glacier area. Since this position is located on a very high peak, the Pakistanis could easily snipe at Indian army positions since the height gave a clear view of the entire Saltoro range and Siachen glacier. On 18 April 1987, the Pakistanis from Quaid Post fired on the Indian troops at Point Sonam located at a height of 6,400 m, killing two soldiers. The Indian Army then decided to evict the Pakistanis from the Post. Naib Subedar Bana Singh was posted in Siachen on 20 April 1987 as part of the 8th JAK LI regiment, which was given the task of capturing the Quaid Post. On 29 May, a JAK LI patrol led by Second Lieutenant Rajiv Pande made an attempt of capturing the post. This attempt was not successful and resulted in deaths of 10 Indian soldiers. After a month of preparation, the Indian Army launched a fresh operation to capture the post. This operation was called 'Operation Rajiv' in honour of 2/Lt Rajiv Pande. It was le by Major Varinder Singh. Starting on 23 June 1987, Major Varinder Singh's task force launched multiple attacks to capture the post. The post was virtually an impregnable glacier fortress with ice walls. Naib Subedar Bana Singh led his men through an extremely difficult and hazardous route. After initial failures, the 5-member team led by Naib Sub Bana Singh successfully captured the Quaid post on 26 June 1987. Naib Subedar Bana Singh and his fellow soldiers, including Chuni Lal, climbed the steep 457 m high wall of ice. His team approached the Quaid Post from an unexpected direction, using a longer and more difficult approach than the other teams. After reaching the top, Naib Subedar Bana Singh found that there was just one Pakistani bunker. He threw a grenade into the bunker and closed the door, killing those inside. He and other Indian soldiers also got involved in a hand-to-hand combat, in which the Indian soldiers bayoneted some of the Pakistani soldiers outside the bunker. A few Pakistani soldiers jumped off the peak trying to save their lives. The post was captured and the operation was a success. "Naib Subedar Bana Singh volunteered to be a member of a task force constituted in June 1987 to clear an intrusion by an adversary in the Siachen Glacier area at an altitude of 21,000 feet. The post was virtually an impregnable glacier fortress with ice walls, 1500 feet high, on both sides. Naib Subedar Bana Singh led his men through an extremely difficult and hazardous route. He inspired them by his indomitable courage and leadership. The brave Naib Subedar and his men crawled and closed in on the adversary. Moving from trench to trench, lobbing hand grenades and charging with the bayonet, he cleared the post all intruders. Nb Subedar Bana Singh displayed the most conspicuous gallantry and leadership under the most adverse conditions."